Bill Horton was a cautious man of the road. and remained faithful to his code. Then very carefully he’d proceed. Last Tuesday, Barack Obama awarded Bruce Springsteen—and 20 other entertainers, artists, entrepreneurs and activists—the Presidential Medal of Freedom, the highest official honor a U.S. civilian can receive. Along with the others, Springsteen accepted the medal. In doing so, he cheapened the value of a brilliant body of work that spans five decades. No one can be surprised that Springsteen smiled for the cameras and allowed Obama to put the ribbon around his neck. Springsteen performed for Obama’s first inauguration. He campaigned for Obama in 2012, after the country’s first African-American president, the self-styled beacon of “hope and change,” had bailed out the banks, refused to prosecute Bush administration officials for the torture of prisoners, established “kill lists,” brutally orchestrated the destruction of Occupy encampments across the country, led an assault on public education in the interest of for-profit charter schools, and overseen the growth of the greatest gap between rich and poor in the country’s history. In 2016, Springsteen again cemented his ties to the Obama administration and the Democratic Party when he campaigned for Hillary Clinton. This after Obama had added to his list of accomplishments the police-state NSA spying program, the assassination of American citizens via drone strike without trial, and the persecution of whistleblowers Chelsea Manning and Edward Snowden (including the torture in prison of Manning). And if, as Obama said at the ceremony, “There is room for everyone” in Springsteen’s America, “everyone” does not include those protesting the Dakota Access Pipeline who with Obama’s sanction have been attacked with water cannons, concussion grenades, rubber bullets, mace and pepper spray. As for Clinton, apart from promising more of the same, she had directed the destruction of Libya as secretary of state, was the darling of Wall Street and the military-intelligence community, and campaigned on a platform of war. Springsteen’s support of Clinton cannot be written off as merely his rejection of Donald Trump. Even if one accepts that a Clinton presidency represented a lesser evil than a Trump presidency, to one as worldly and astute as Bruce Springsteen she still represented plenty that was evil. He played and sang at a Clinton rally. He played and sang for war, economic oppression and police-state surveillance. What happens to that sustenance, then, when the artist betrays the art? There is a naivete to this question, of course. In Thomas Hardy’s novel Jude the Obscure, the young and sensitive Jude is so moved by a piece of church music that he looks up the composer hoping to find an enlightened spirit. He is crushed that the man who answers the door is an ordinary guy who doesn’t understand what Jude is talking about except that he doesn’t seem to have come bearing a royalty check. It is easy to invest art with our projected fantasies and then to attribute the fantasies to the artist. Springsteen’s art, though, is more explicit than a piece of instrumental music. In song after song, album after album, he has told stories of recognizable people confronting familiar problems in familiar—if sometimes inspired—ways. On Born to Run, the couple in “Thunder Road” transcend the conventional pop music lovers. The singer “ain’t no hero” and Mary “ain’t a beauty.” The two of them are “not that young anymore,” but in the end they simply run away from their “town full of losers.” By The River, Springsteen and his characters have learned what Mark Twain knew but his hero Huck did not, that you cannot simply “light out for the Territories.” The town full of losers extends from coast to coast, and we who would run away are bound to face our own losses. The worst of these are that we lose ourselves and we lose each other. And this is where Springsteen took his most inspiring stand. After losing their innocence, his songs never became cynical. He never jettisoned the values of love, integrity, or community—all of which are assaulted from within and without in a real life. All of which must be fought for. Almost alone among popular artists, Springsteen has written truthful songs about marriage, family, aging and matters like police violence, economic injustice and war. More than this, though. Springsteen has performed these songs, and it is in his performance that he famously leads audiences on an emotional and moral journey. He not only wrote the songs, he gave seemingly incontrovertible evidence that he believed them. And it was Springsteen’s own belief that gave such power to his performances. Two of the most common remarks about Springsteen concerts are that they will change your life and that they are like a religious experience. Having been to a number of his shows (back when tickets were affordable) I can endorse both these statements. But there is danger in such experiences. After all, not every change is for the better, and not all religious and quasi-religious experiences produce humane results. But again, Springsteen’s work is explicit. People must work to be true to themselves, he insists. They must work to be true to one another. And though he did not write the song “War,” he has sung as forcefully as anyone ever has that war is good for absolutely nothing. 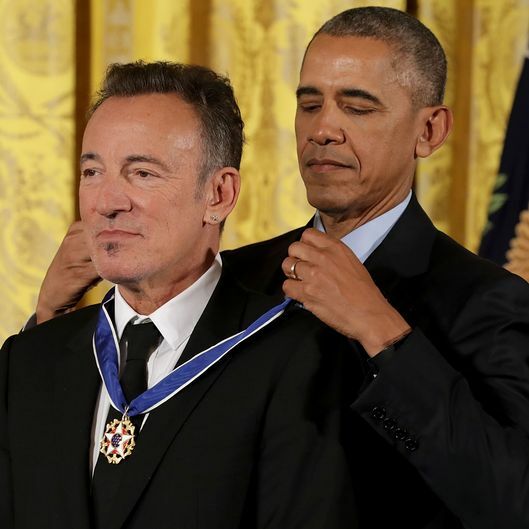 Again, there is no surprise in Springsteen’s accepting a medal from Obama. He has for decades belonged—in every sense of the word—to the one percent. But in this grim season of the ascension of American fascism, an ascension made possible by the bankruptcy of the Liberals, perhaps I hoped Bruce would disentangle himself from the Obamas and the Clintons. That he would speak the truth and damn the consequences. But he has had too many millions for too long (Springsteen is worth $345 million). He has been too flattered by the powerful, has been surrounded by too much luxury, has traveled too long in the circles of the Liberals, who have too much at stake in the current order of things to question the songs sung by Obama and Clinton, CNN and MSNBC. But if I am truthful, I will recognize that the acquisition of fame and fortune was always part of Springsteen’s American Dream. The young rock and roller cannot be blamed for wanting, as he used to say in concerts, everything. But the older Springsteen, the one who wrote the albums The Rising and Magic and Wrecking Ball, that Springsteen knew better. He knows that wealth comes at the cost of poverty. And he knows that American wealth comes at the cost of war and is increasingly held onto with open state violence. And so I am bereft today. I have lost Bruce Springsteen. I will still listen to his music, will still watch his electrifying performances on YouTube. I will still sing his songs in the car. But what will my voice sound like now that his has dropped out?